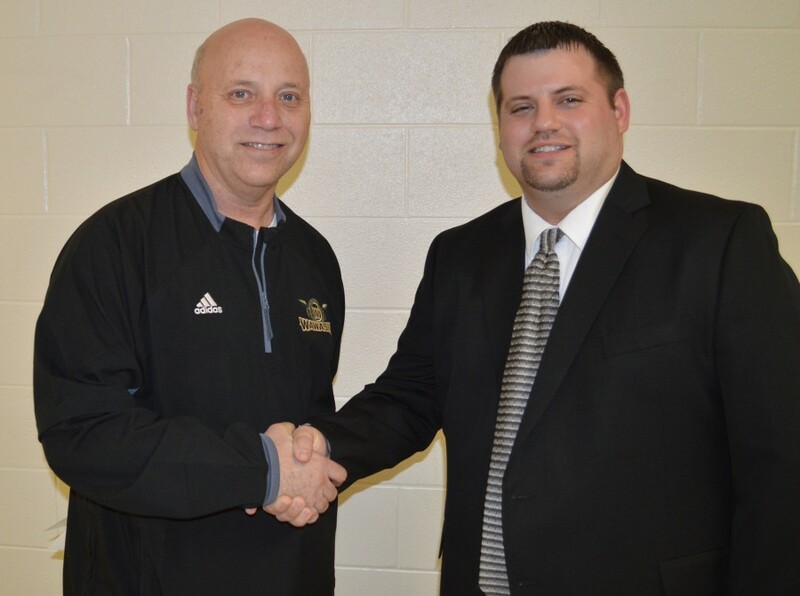 Wawasee Athletic Director Steve Wiktorowski, left, welcomed Matt Carpenter, the new girls varsity basketball head coach, during the school board meeting Tuesday. Matthew Carpenter will be a math teacher and the new head coach for girls varsity basketball beginning with the 2016-17 school year. A graduate of Goshen High School, he has taught and coached girls basketball at GHS for several years. Kayla Riportella will be a language arts teacher and the head volleyball coach, also beginning with the 2016-17 school year. A graduate of Maine West High School in Illinois, she played collegiate volleyball at Goshen College. She did her student teaching in Wawasee High School English classes and also was an assistant volleyball coach last season for Wawasee. In other business, the school board approved awarding summer construction project bids. Hamilton Hunter Builders Inc., based in Fort Wayne, was awarded a bid for interior renovations at the high school in the amount of $1.729,565. Milestone Construction of Syracuse was awarded a bid for work at the school corporation transportation building and resurfacing the outdoor track at Milford School in the amount of $508,700. Milestone had previously been awarded a bid for interior renovations at Milford School. Interior renovations at the high school will include renovations of several rooms including band, choir and art. The basketball concessions area will be improved, parts of the media center will be renovated and tables will be removed from five language arts rooms, each of which will also be renovated. Some, but not all, of the general computer labs will be replaced by classroom space. And the technology department will be renovated. At the transportation building, a new fuel tank will be installed, replacing an outdated one located near where the old bus garage used to be. An emergency generator will be installed at the transportation building too. The only other item on the agenda was a first reading of an updated board policy dealing with criminal gang activity. School corporation attorney James Flecker said Indiana Code requires the policy to be updated by June 1. It was also noted there have been 30 applicants as of Tuesday for the head coach of boys varsity basketball at the high school. It is hoped the field will be narrowed to three and the new coach will be chosen from among those three.